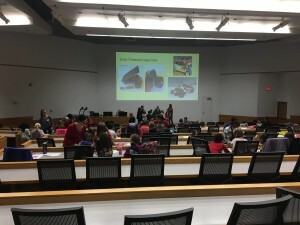 Thank you to everyone that attended the Spring 2019 Girl Scout Patch Day. 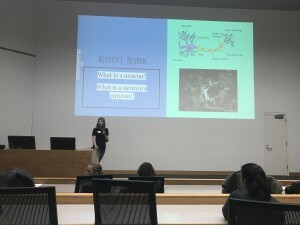 Girls learned about Bio-systems and sustainability and how they relate to science and engineering through the modeling of ideas and making educated guesses. Girls had a chance to work in small and large groups while completing hands-on and interactive activities. Please check back for more information on our Fall 2019 Patch Days. Meet the 2018-19 Girl Scout Co-Chairs! My name is Sanjana Rao and I’m a sophomore studying Computer Engineering and Computer Science! I have been a member of SWE since first semester freshman year, and I have thoroughly enjoyed my involvement, especially with Girl Scouts. SWE has provided me with priceless mentorship, networking, and volunteering opportunities that have been a big part of my college career so far. Aside from volunteering for Girl Scouts through SWE, I also work for the Help Desk at DoIT (UW Madison’s IT center). Being a SWE officer this year combined with the leadership opportunities I’ve been given from work makes me very excited to kick off my second year here at UW-Madison! My name is Lily Samuels and I’m currently a Senior in Biological Systems Engineering. I could not be more excited to be a Girl Scouts Co-Chair as these are my favorite activities to do with SWE. I also really enjoy going for runs and going to the Farmer’s Market every Saturday! When I’m home I spend every second I can with my cat, his name is Watson and he’s the cutest thing on the planet. 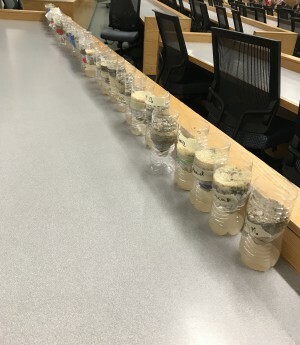 The girls explored water sustainability and made water bottle filters to discover efficient ways to filter dirty water using the limited resources they were presented with. They also learned about solar and wind energy by building solar powered Lego cars. 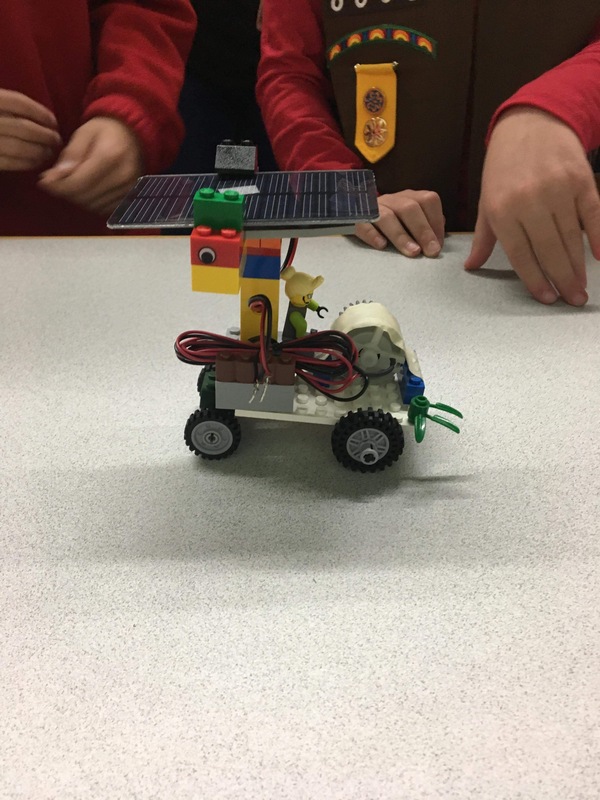 Girls worked in small groups to design, build, test, and retest their cars using solar panels at different angles. To learn about wind energy, they completed a MacGyver wind turbine challenge where they varied the blade size, number, and angle. The girls followed a step by step demonstration on making their own neuron out of pipe cleaners. 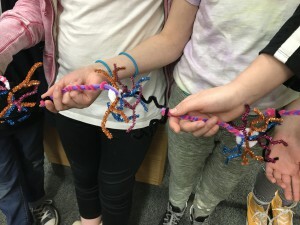 After their pipe cleaner neurons were constructed, they enjoyed ‘sending messages’ with their neurons by getting in a line and passing a message of something they wanted the volunteer to do at the end of the line (i.e. jumping jacks, five push-ups, or a cartwheel). The kidney filtration activity taught about the role kidneys play and the issues that can arise when the kidneys do not filter correctly. The girls designed a filtration system for ‘blood’ (water with rice and small pebbles) and then chose different size mesh filters to create the optimum ‘blood’ filter. They then tested their filters by pouring their ‘blood’ through the filter and seeing what got past their filtration device. Led by a Biomedical Engineering Senior Design team, the girls were taught about exoskeletons in relation to the supersuits of superheros! 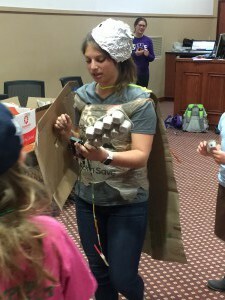 The BME team led the girls through the full design cycle where they made their own exoskeleton in groups for the superhero volunteer using materials that are found around the house (cardboard, newspaper, aluminum foil, sponges, etc. ).